Sign Up Open for Registration! The Windswept Farm community invites you to participate and support the 2019 growing season by offering memberships to our second Community Supported Agricultural (CSA) Program. A CSA is a membership-based opportunity that engages shareholders in supporting the development of local, small scale, innovative and organic agricultural systems. Members receive multiple benefits, largely through weekly shares of the current harvest, first picks on the season’s best offerings, weekly newsletters with recipes and information on the vegetables, and a connection to the Windswept community that tends to your food. Members will have numerous opportunities to visit our farm to learn how the food is produced and to build strong relationships with the growing Windswept Farm community. The 2019 CSA will be a market style in which you will have flexibility in selecting produce that is over abundant in addition to receiving a set selection of vegetables each pick up time. For example, your CSA share will include “up-to” quantities listed per item; “one of x or one of y” when limited in quantities of comparable items (i.e., broccoli or cauliflower); and the ability to select “extras” when available. This market style CSA will allow you to have ample selections that will challenge your culinary skills without leaving you with unwanted produce. Pick up will be on Tuesday afternoons at the on-site Windswept Farm Barn. You can select picking up your share weekly or biweekly (on set schedule). If you chose a biweekly pickup, we invite you to come to the farm barn on your “off” week to shop for produce that you need (i.e., fresh greens) and other available products. 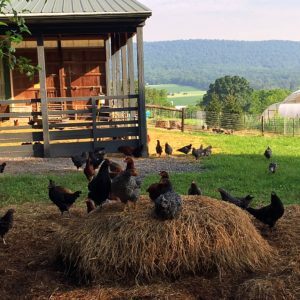 As a CSA member, you will receive a 10% discount at our onsite farm Barn for eggs, meats and other already prepared foods created on site by RE Farm Café chefs and partners! Windswept Farm began as an ambitious effort to merge sustainable agriculture, food systems, and development while serving the Central PA community. We are passionately committed to following organic and sustainable practices to produce a vibrant and tasty assortment of fresh vegetables, fruits, meat, and eggs. We are looking forward to sharing our passion with you and showing you the importance of agriculture in your community.